Summer always brings about lots of food memories. There are so many tasty things that only come once a year and so many traditions that make me recall past years. I’ll make a s’more over a campfire and remember the s’more I made last year (added peanut butter–oh, yeah!) and every s’more I shoved in my face as a kid. I’ll see kids selling lemonade and remember the hundreds of summer afternoons I passed selling kool-aid on the corner with the neighbor boy. I think back to summer vacations and remember the amazing lobster I ate in Maine or the spit-roasted pork I gorged on in Croatia. I’ll pass a roadside stand selling home-grown, super ripe, red, glossy strawberries and think about all the times my mom packed me up in the station wagon and drove to the patch to pick pound after pound of berries. And then I’ll remember the most epic trip I ever took to the berry patch, the trip that solidified my destiny to become obsessed with eating well. It was also the trip that, twenty-some-odd years later, helped me come up for a name for my blog. This berry-picking adventure is one of my earliest and most vivid childhood memories. 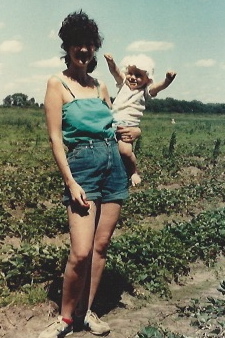 I was a chunky, bow-legged 3-year-old, dressed for action in my Osh-Kosh-B’Gosh flowered shortie overalls. My mom and dad packed me and my brother up into our old boat of a Chevy and we headed out to the country to load up on strawberries for freezer jam, shortcakes, and pink malts. At some point in the journey, my parents informed me that it was okay to try a few berries as we picked, you know, test the product and make sure the berries were up to snuff. Well, I know exactly which part of the instructions I tuned out–“a few”. My mom, dad, and brother picked for hours, filling up pails and boxes. And I picked right alongside, it’s just that none of my berries made it into my bucket. Nope, they all went straight down the hatch. Berry after berry. Needless to say, the car ride home was not terribly pleasant. Seems my 3-year-old belly couldn’t quite handle the gallon of berries I had so greedily eaten. My mom rode in the backseat with me, stroking my tummy. My big brother sat shot-gun, wishing he was still an only child, and my dad drove home in silence, thankful that his car upholstery was the same color as my ruby-red strawberry puke. But that’s a pretty gross story. Amusing, maybe, but pretty gross. 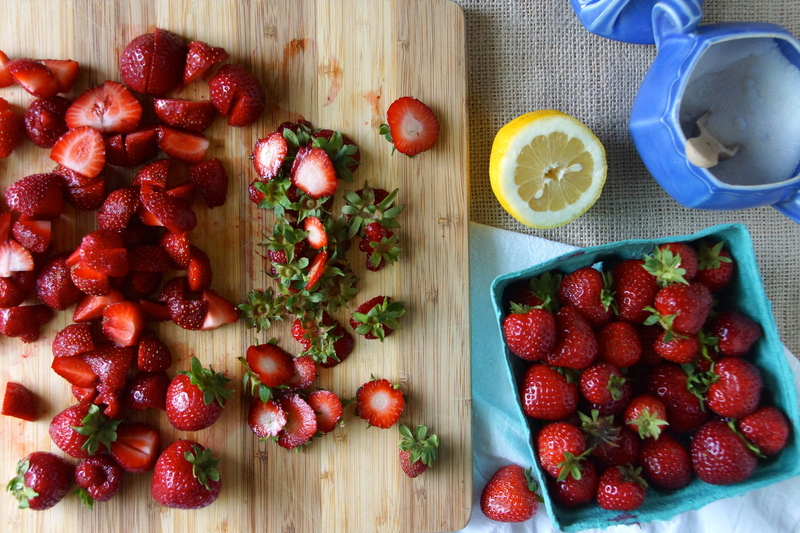 How about a more recent, more appetizing story to get us in the mood for strawberries? A few year’s back, I spent a few early summer days in the South of France. It was lovely: beautiful small towns, acres of vineyards, and delicious food around every turn. There was one particularly good lunch that ended with a dessert that stands out more than anything else I ate on the trip: strawberry soup. It was terribly simple, but so, so good, just perfectly ripe strawberries, sweetened and puréed, and served with a scoop of vanilla ice cream. It tasted like being in a strawberry patch. It tasted like every happy memory from past summers and every happy summer memory that’s yet to be made. So let’s do it. 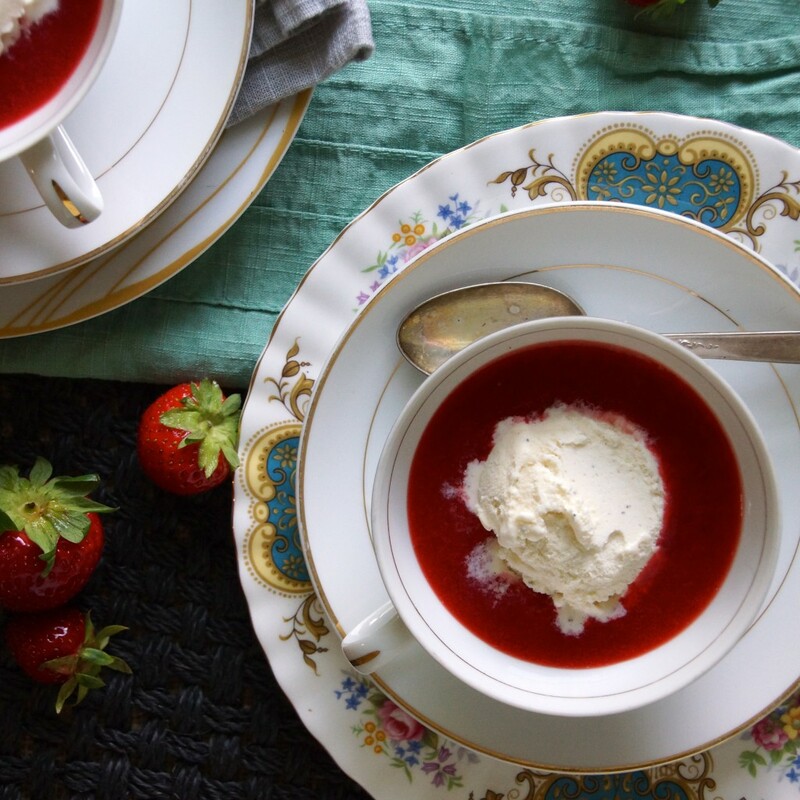 Let’s eat a great dinner on the patio then dip into a bowl of strawberry soup just as dusk settles in. Let’s make a new summer tradition from a past summer’s memory. Let’s make some strawberry soup. 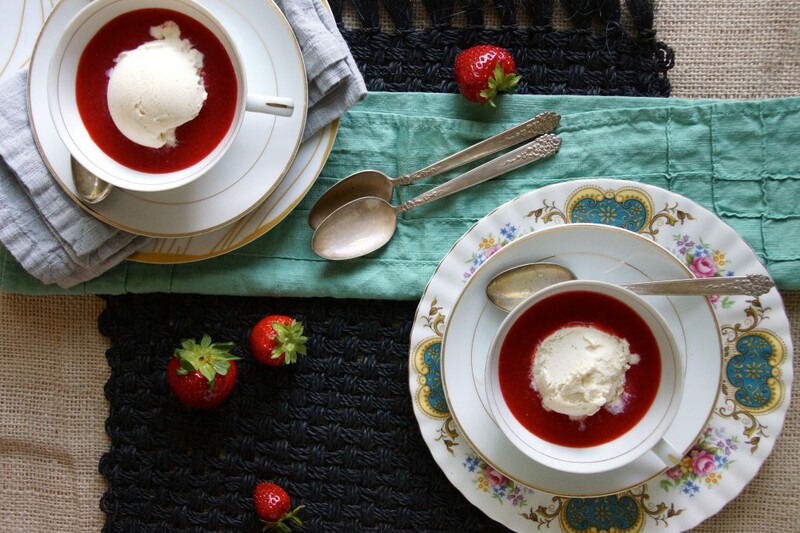 The only “trick” to great strawberry soup is great strawberries. Surprise! Pass on the giant supermarket strawberries that are trucked in from who knows where. Those’ll do in the off-season when we just need our berry-fix, but for this soup to amaze, we need really ripe, super flavorful berries. 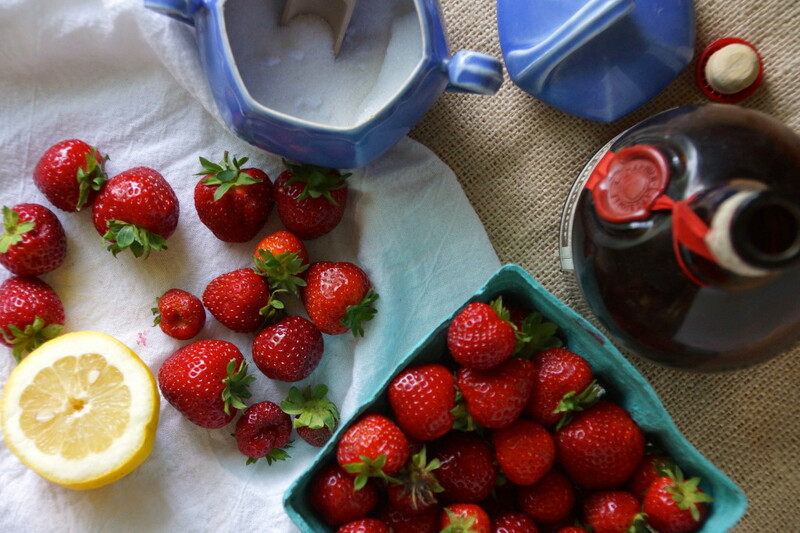 Maybe you have strawberries growing in your yard (lucky!) or maybe there’s a patch nearby where you can pick your own (just make sure you don’t over-sample!). Otherwise, head to the farmer’s market or watch for road-side stands and I’m sure you’ll spot some good, juicy strawberries. Once you’ve obtained the perfect berries there’s not much left to do. Remove the stems, puree, and sweeten. I add a little of oomph with a splash of Grand Marnier and keep the sweetness in check with a squirt of lemon. Strain to remove seeds and chill. When you’re ready for dessert, ladle the cold soup into bowls and float a scoop of ice cream in the center. I opt for good, store-bought vanilla because I like to keep the flavors simple and the prep work minimal. If you want something showier, home-churned basil or buttermilk ice cream would surely impress. Summer in a bowl. Slurp it up and enjoy! This soup is only as good as the strawberries you use. I recommend very ripe, small, home-grown strawberries rather than huge berries you find at the supermarket. Place the strawberries and 2 Tbsp. of sugar in the bowl of a food processor or blender. Using short burst, puree the strawberries until almost smooth. Taste and add the remaining sugar, if needed (it just depends how sweet your berries are to start with). Add lemon juice and Grand Marnier and pulse to combine. Place a fine mesh strainer over a medium bowl. Pour the strawberry soup through the strainer, gently helping it through with a rubber spatula, to remove (most) of the seeds. Cover and chill for at least an hour before serving. 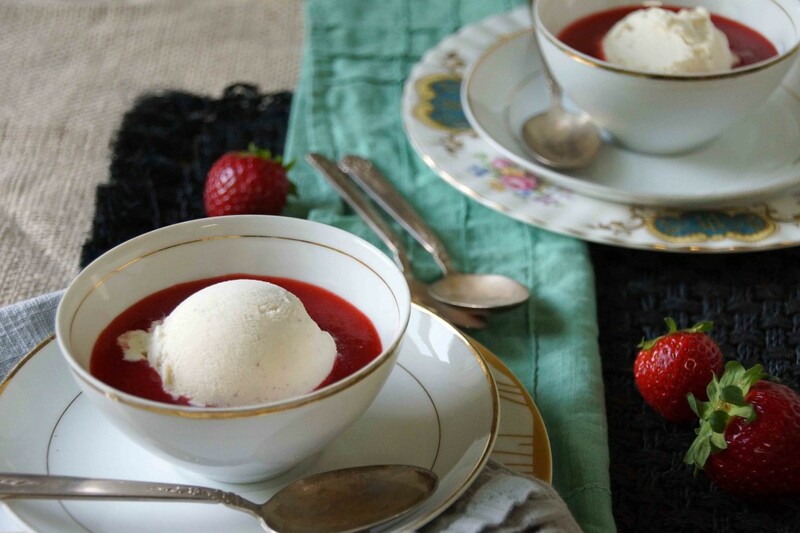 Place a scoop of ice cream in a chilled bowl and surround with the chilled strawberry soup. Slurp it up and wish strawberry season lasted through the year. * I quarter the berries to give my food processor a head start. If you over-blend the soup, it becomes pink and foamy which is not the look I'm going for! ** Leftover strawberry soup is great for breakfast with plain yogurt in place of the ice cream. Yes! Thanks for digging that picture up for me and letting me show off your 80’s style! Oh MY…this looks so delicious! 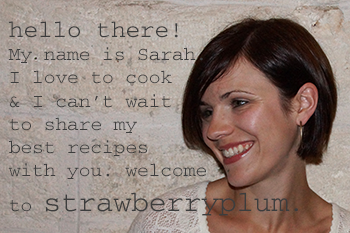 I loved reading your story about picking strawberries…a little gross perhaps but still so much fun to read. I took my 3 year old son strawberry picking this year. There wasn’t any puke but now whenever we return to the farm he asks to pick more. It is hard to explain that they are all gone near us now. I froze a few pounds in the freezer and I wonder if I could defrost them to make this soup? I’m sure as long as the berries were nice and ripe when they went into freezer they could certainly be defrosted and made into this soup. I’m jealous you and your son got to pick your own; I don’t think I’ll get the chance this year.